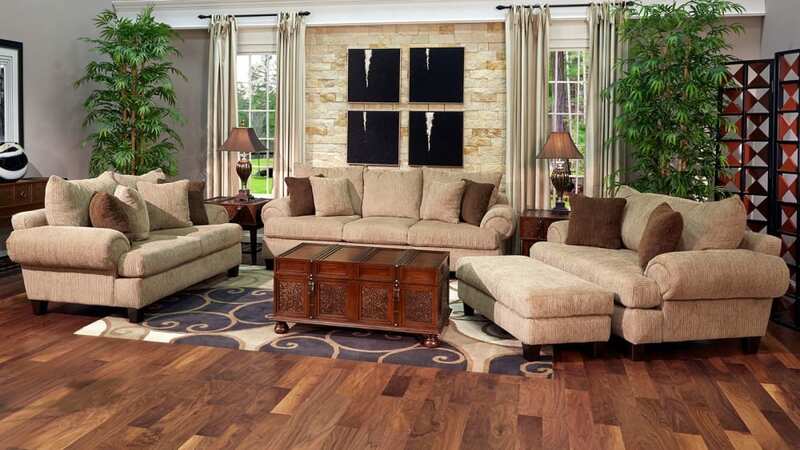 The Brenham Living Room Collection provides the perfect classic foundation for your new living room. Build your dream decor from the bottom up. A neutral palette invites you to add a few pops of rich earth tones or a bold piece of wall art to draw the eyes. This set includes one sofa, one loveseat, one chair, and one ottoman. Velvety soft corduroy fabric feels welcome on your skin. A soft sand color will look perfect with any color scheme. The solid base of each item comes supported by deep espresso column legs that perfectly complement the fabric. Pillow-top cushions allow you to sink into some rest and relaxation after a long day. The sofa and loveseat both come with four throw pillows for extra support. The pillow sets come with two tan and two brown for a subtle contrast. Two tan throw pillows are featured on the chair as well.